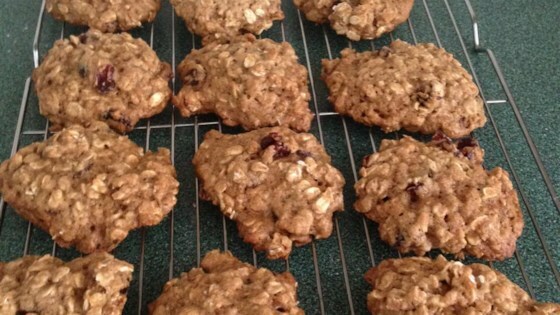 "Orange flavored oatmeal cookies are made moist with applesauce and tangy with cranberries." In a large bowl, cream together the butter, white sugar and brown sugar until smooth. Mix in the applesauce, eggs, orange juice and orange zest one at a time, mixing well after each. Combine the flour, baking soda, cinnamon and nutmeg; gradually stir into the orange mixture. Fold in oats and cranberries. Drop by rounded spoonfuls onto the prepared cookie sheets. I will not make these cookies again. I use fresh cranberries and they did not taste good and the glaze was not good. I did follow the recipe to the tee. These cookies were very moist and I loved the cranberries in them. I'm not huge on citrus but the girls at work absolutly loved them. Absolutely AMAZING!!! I gave them away to my neighbors and even to a girl I'm interested in dating. I watched her eat some and keep going back for more. They are that good! These cookies were easy to make and yummy!